Abrictosaurus was lived during the Jurassic period about 200 million years ago in Woodlands of Southern Africa. It was 4 feet long and weighed about 100 pounds. As we can see according to its head shape and body shape, Abrictosaurus was a herbivore. Just like another dinosaurs, Abrictosaurus is known from its limited remains, the incomplete fossils. The Abrictosaurus was having teeth that close relative to Heterodontosaurus and just like another dinosaurs that lived during the Jurassic period, Abrictosaurus was quiet small. The adults only 100 pounds weight. The skull had a triangular profile, compressed on the sides with two large circular orbits, equipped with only two small teeth in front and have so many conical teeth. This dinosaurs also equipped with robust jaws. The upper jaw had about 25 teeth and the lower jaw, had 27-28 teeth. The front legs were small and quite thin. 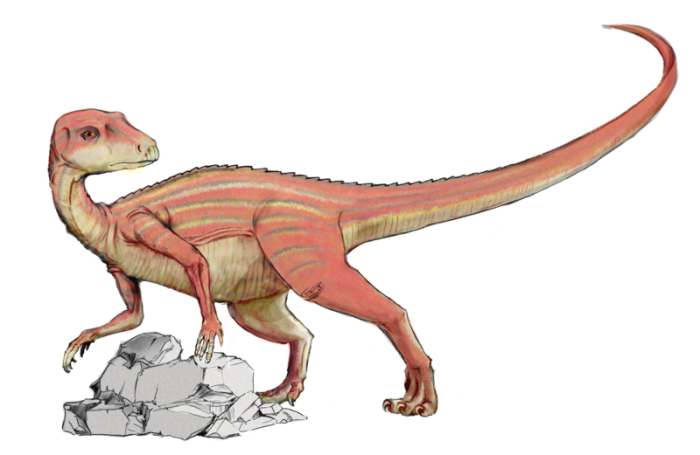 Abrictosaurus walks with its hind legs and been a swift runner. Originally, according to the paleontologist, Abrictosaurus was once attached to South America, from this , we knew that Dinosaurs were spreading and migrated to different parts of the world. Abrictosaurus was found in Lesotho and Cape Province in South Africa. Firstly found in 1974 by Richard Thulborn, then found again by James Hopson in 1975.